In Tibetan Buddhism, it is believed that Tertons are born with a purpose of discovering spiritual treasures hidden by their master Guru Padmasambhava. One such Terton was born in Bumthang district in the 15th century. According to the narrative, Pema Lingpa had a vision where it was revealed to him that a treasure lay hidden in the lake. The local ruler and the community cynical of his claim, Pema Lingpa leapt into the lake with a burning butter lamp and is said to have reemerged from the lake with the treasures and the butter lamp still lit. Hence the lake was named Mebar Tsho. Mebar Tsho which translates to “the burning lake” is a sacred site for the Buddhist devotees. Located in the central valley of Bumthang on the way to Tang village, the lake has become a popular tourist attraction spot. Diverting off the national highway, travelers drive up an unpaved road and on arrival at the site, the travelers then descend towards the lake on foot along the steep hill. The shallow Tang River is channelized into a deep narrow gorge entering the sacred lake’s proximity and eventually widens after exiting the gorge. Since swimming or fishing in the lake is strictly forbidden, the depth of the lake and what could be underneath remains a mystery. 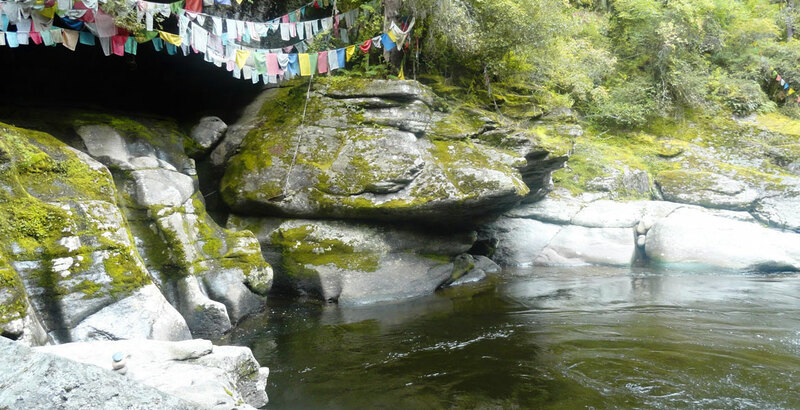 For the unwavering Buddhist faith practitioner, staring down the impervious river squeezed in between the gorge is a terrifying experience for they believe it to possess spiritual power and that falling into the lake would be equivalent to jumping into a dark abyss. The gorge is connected by a traditional bridge adorned with multicolored prayer flags. Travelers can cross the bridge and go further down near the lake and offer prayers if they choose to.